We’d love your help. Let us know what’s wrong with this preview of Seraphin by Philippe Fix. 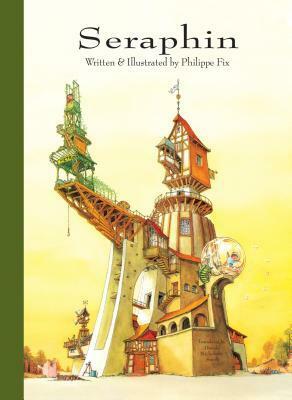 From Hans Christian Anderson award-winning author Philippe Fix, a dazzling portrait of a dreamy optimist filling Paris with ingenious gadgets, toys, and magical contraptions. Seraphin, dreaming of gardens full of birdsongs, sunny avenues, and flowers, works as a ticket seller in a metro station underground. One day, after being scolded by the stationmaster for trying to sav From Hans Christian Anderson award-winning author Philippe Fix, a dazzling portrait of a dreamy optimist filling Paris with ingenious gadgets, toys, and magical contraptions. To ask other readers questions about Seraphin, please sign up. This is a brand-new English translation of a 1967 French picture book that maybe should've stayed untranslated. What starts out looking like a charming story about a funny little man rather abruptly devolves into a head-scratcher with a deux ex machina ending. We're introduced to Seraphin, an old man who--for some reason--has never decided what he wants to be when he grows up. He has a short career as a ticket puncher before fate intervenes and somebody leaves him a ramshackle house in their will This is a brand-new English translation of a 1967 French picture book that maybe should've stayed untranslated. What starts out looking like a charming story about a funny little man rather abruptly devolves into a head-scratcher with a deux ex machina ending. We're introduced to Seraphin, an old man who--for some reason--has never decided what he wants to be when he grows up. He has a short career as a ticket puncher before fate intervenes and somebody leaves him a ramshackle house in their will. With the help of his friend, a little boy named Plume, he fixes up the house. Then he builds a great music-making machine. The friends live happily in the house, which may or may not be possessed; there's a weird incident that seems to have nothing to do with anything, where Plume's sitting by the fire and the sound of squealing sap makes all the carvings and pictures in the house come to life. Eventually, the government comes and tries to evict Seraphin to build condos on the land. He and Plume hole up in the house until the authorities come banging on the door. Then they build a wooden tower up from the top of the house to escape. Just when it looks like they're about to be caught... they step off into the sky on a set of movable stairs. Unfortunately, I'm not kidding. The book doesn't seem like it's going to be fantasy, and then all of a sudden it throws in stuff like the moving statues and the walking on air. It's really disjointed. On top of that, it's a bit of a chore to read. This is very heavy on the text for so short a book. In any case, this isn't really a book I'd recommend. It's too wordy, and the plot goes from intriguing to downright silly in the final act. Detailed, imaginative French 1967 book in translation. I read many historical children's books, so the higher reading level of the text didn't bother me. But, it is different than the text of contemporary children's books (more words, written for all ages). The story of the inventor is told with text, yes, but also amazing illustrations. Each page deserves loving scrutiny. And, the hero's final creation is stupendous. Wonderful, wonderful book. Particularly good for that younger tinkerer or make Detailed, imaginative French 1967 book in translation. I read many historical children's books, so the higher reading level of the text didn't bother me. But, it is different than the text of contemporary children's books (more words, written for all ages). The story of the inventor is told with text, yes, but also amazing illustrations. Each page deserves loving scrutiny. And, the hero's final creation is stupendous. Wonderful, wonderful book. Particularly good for that younger tinkerer or maker in your life. Seraphin is a cute, quirky, philosophical tale about Seraphin and his friend Plume. Seraphin was happy just being his own self but that soon ran afoul of his boss, his landlord, and others in the community. Rather than changing who they are, Seraphin and Plume decided to change the town and built a staircase that would lead them away to new adventures. While the book is long by today's standards, it was originally published in French in the 1960s and expects adults to read to younger children. I Seraphin is a cute, quirky, philosophical tale about Seraphin and his friend Plume. Seraphin was happy just being his own self but that soon ran afoul of his boss, his landlord, and others in the community. Rather than changing who they are, Seraphin and Plume decided to change the town and built a staircase that would lead them away to new adventures. While the book is long by today's standards, it was originally published in French in the 1960s and expects adults to read to younger children. I enjoyed the illustrations and the story. It reminded me of Dahl and Suess rolled into one. This is a new, and newly released, translation of a picture book originally published in French in 1967. It's whimsical and it occasionally hits a charming note, but, being text heavy, brief, and random in terms of narrative and tone, it never seems to take off. The cover is gorgeous and there are a number of engaging splash pages, but the colorful and often cleverly composed art mostly just serves to emphasize the absence of a compelling story. Our hero, Seraphin, is dreamy and impractical and his experiences become increasingly fantastical and magical as the story progresses. I guess that's fine for a picture book, but this book is crammed with text, and that text is disjointed and never takes us anywhere. So, for all its charming drawings I was left with the impression that this book held the reader away at arm's length, and that's a tough sell. I liked looking at this book but I can't imagine how I'd read it to a kid. I loved the illustrations for this children's book, bright colors and lots to look at! I liked the story in the beginning but it seemed to get weirder and weirder, with animated story characters, then the eviction proceedings, animated dragons, and lastly that stairway to nowhere, then the story just ended. It was a really strange ending! *Disclaimer: I received this book for free from NetGalley in exchange for an honest review. I was immediately drawn to this picture book by the artwork and the fact that it's translated from French which I usually enjoy. However this was a disappointment for me. The artwork, though fine, wasn't as appealing inside the book and I feel that this is mostly due to the story. The first half was boring and the second plain nonsensical, and not in a quirky way. The whole thing was confusing and didn't ke *Disclaimer: I received this book for free from NetGalley in exchange for an honest review. I think it was a cute little book, fanciful, and with sweet illustrations for children. Fanciful though is the word that sticks with me the most when I read this and I'll be reading it to my daughter. I received this on Edelweiss from the publisher in exchange for my honest review. A Hans Christian Anderson tale with a smudge of Maurice Sendak, the illustrations are the highlite if this strange little book; particularly the full page art.